Allows you to write in comfort without a desk. 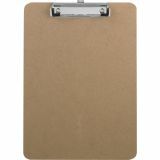 Made of 1/8" thick hardboard with a smooth writing surface on both sides. Equipped with a flat clip and rubber grips. Sparco Flat Clip Rubber Grip Hardboard Clipboard, For Letter Size Papers, Brown - Hardboard clipboard allows you to write in comfort without a desk. Made of 1/8 thick hardboard with a smooth writing surface on both sides. Equipped with a flat clip and rubber grips."